The whole creation is an alternation of active and passive phases called the days and nights of Brahma. The days are again divided into sub-periods called Manvantaras which are further divided into cycles called Yugas. Each great Yuga is subdivided into four Yugas which are composed of units containing 432 solar earth years multiplied by tens, hundreds and thousands. The apparent rotation of Jupiter around the earth zodiac is twelve solar years. Six sets of 72 years give the duration of time for Jupiter to go round the apparent zodiac 36 times and for the precession of the equinoxes by 3 degrees. This period is 432 years which forms the base number for the computation of the great cycles of Yugas and Mahayugas. This is how Master EK (Ekkirala Krishnamacharya) explains one aspect of Number 432. It is a major key to divide time into various ages that mark different cycle and different energies. “One thing that my favorite rose windows do is work at the limits of our perception of color. At the edge of blue-violet/ultraviolet, our perception drops off, but right at that threshold there’s something interesting going on energetically, a kind of electric pulsing that is hard to describe but I think we all feel it. In many of his teachings, Master KPK (K. Parvathi Kumar) explains the qualities of violet and working with its energy. Violet can be experienced in the interludes between the known and the unknown. It is the bridge into the subtle world. Read more about working with violet color here. See here my other blogposts about the work of Chris Jordan: “E Pluribus Unum” – From Many, One: A Sublime Mandala Work, Midway – A Love Story for Our Time from the Heart of the Pacific, Chris Jordan: A Slow-Motion Apycalypse in Progress. 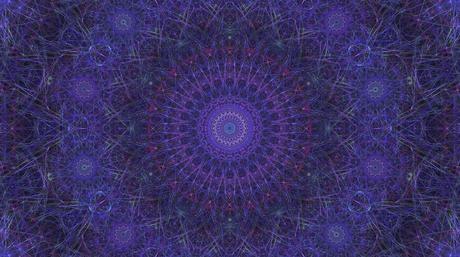 Click on the picture (from the video, copyright Chris Jordan) to see the video Mandala 432 on his website. The music is King’s College Choir in Cambridge, UK.